The Historical Society of Rockland County's facilities provide 14,000 square feet of space; approximately half of that space is for public use; 34 percent, for collections storage; and 16 percent, for administration. All public areas are ADA-accessible. The buildings are located on seven acres of landscaped grounds. The HSRC owns four structures on four acres, and the Town of Clarkstown makes an additional three acres available for parking, nature trails, and picnicking, and well as to buffering the historic farm site and its immediate suburban community. History Center: The 7,200 square foot History Center contains two museum galleries, administrative offices, a library, and collections storage. Built in 1978, the brick, concrete, and steel facility is fireproof. The ADA-compliant main level contains the lobby and reception area, 2,170 square feet of exhibition space, a small Museum Shop, and public restrooms. The lower level contains collections storage spaces along with the Community Room, which is used for meetings and educational programs. Public restrooms and a separate ADA-accessible entrance are also available at the ground level. The History Center museum and galleries feature brand-new HVAC systems, with filters and temperature and humidity controls throughout the building's exhibition, collections storage, library, and office spaces. Jacob Blauvelt House: The Jacob Blauvelt House is a two-story vernacular brick farmhouse built circa 1832, with an added wing that dates to the 1930s, comprising 2,500 square feet. The 1,200 square foot historic area on the first floor features six furnished period rooms; the twentieth-century wing provides modern kitchen facilities. The second floor contains a caretaker's apartment, as well as storage for publications and educational materials. Temperature and relative humidity are also monitored and controlled at appropriate levels for each area and are supplemented with dehumidifiers and humidifiers that are monitored weekly. Historic Barn: The unheated post-and-beam Anglo-Dutch barn features a 1,500 square foot main section built circa 1865 whose floor space is used for exhibits of farm equipment and for demonstrations. The circa 1900 wing contains 2,000 square feet of floor space that is currently used for non-collections storage. A cinder-block tool shed houses maintenance equipment and a workshop. An attached, unheated, 800 square foot post-and-beam Carriage House, also built circa 1865, is used for general storage. The HSRC's activities are allocated to appropriate building spaces. 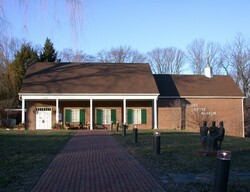 Thematic exhibits, lectures, meetings, workshops, and research facilities are housed in the History Center museum, and period exhibits, craft and cooking demonstrations, and tours are held in the Blauvelt House and the Historic Barn and Carriage House.